Mountain bikers: The Renosterveld and farming landscapes between Bredasdorp and Swellendam are a fairly new… and growing mountain biking destination. And that includes routes crossing our Haarwegskloof Renosterveld Reserve – which is home to the largest connected stretch of Lowland Renosterveld left IN THE WORLD. The trail through Haarwegskloof is on an existing road (we are not making new trails through our Renosterveld!). 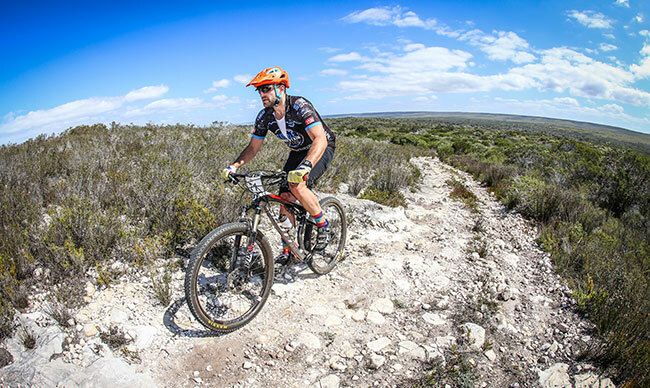 Trails organised by the De Hoop Vlei MTB Experience take cyclists on a testing 68km ride from De Hoop Nature Reserve, through our reserve. 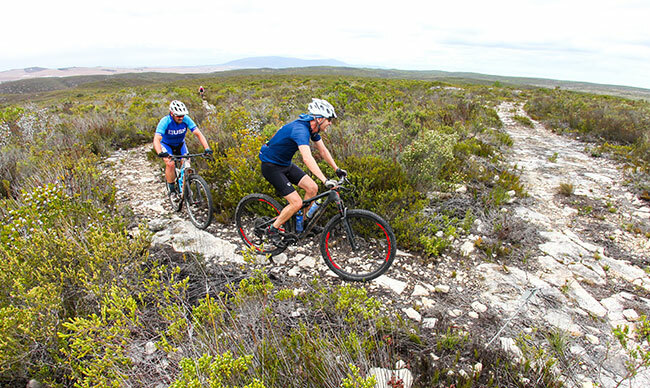 The route forms part of the De Hoop Vlei MTB event, which took place for the first time in September this year. 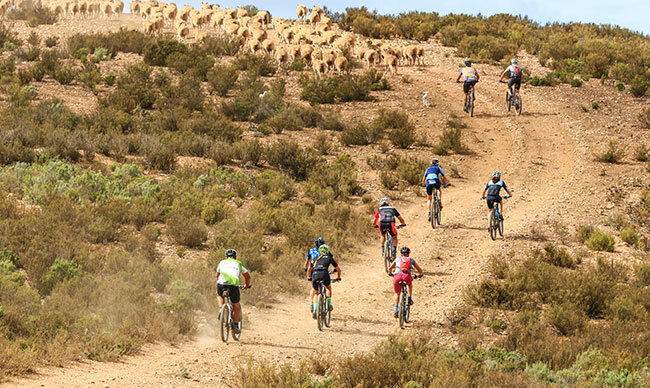 The unique route was created with the expertise of local farmer, Niel Neethling, together with the Overberg MTB events. This route (it was stage 1 of the event) involves 1258 metres of climbing. And it includes the Renosterveld Roller-Coaster (your reward after summiting Haarwegskloof). 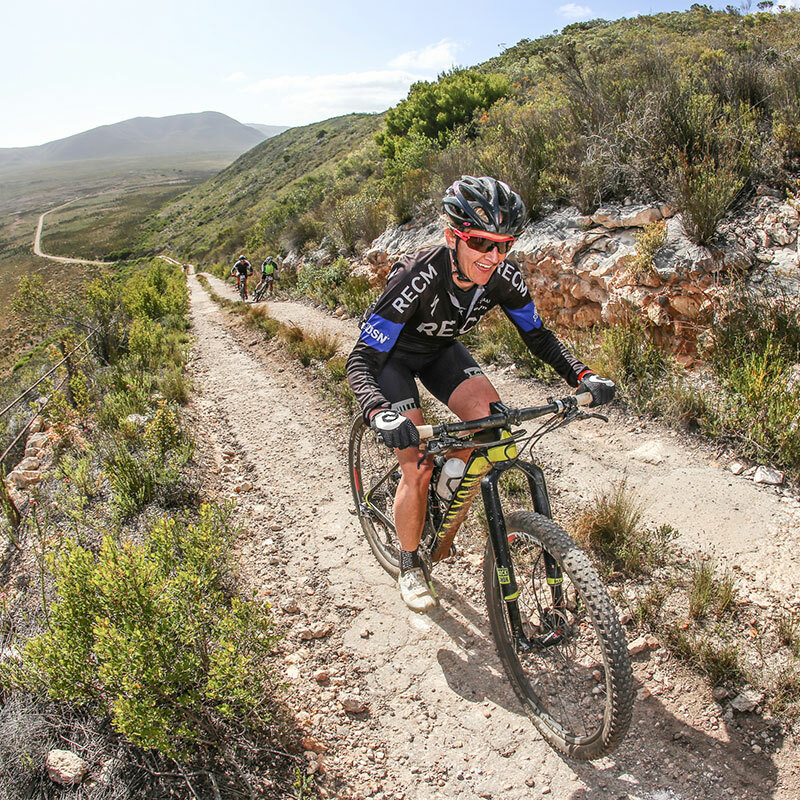 The route back to De Hoop from Kat Kloof involves a single track technical climb over ‘Dennis the Menace’. While it is undoubtedly a challenge, the worst sections feature concrete ramps to even out the gradient and provide much needed grip. The route home from the top of the final climb provides an easy final 5 kilometres back to the De Hoop Collection – where you can be crowned a Haarwegs Hero. The routes were designed for the event – but there will soon be an official marked trail that riders can access. And in January, they form part of two training camps (from 11-13 January and 26-27 January) – to prepare you for your year of cycling (take note: Cape Epic riders). The camps are hosted by De Hoop Collection Nature Reserve. UCI accredited coach Lance Stevenson from Daisyway Coaching Systems and Anneke Viljoen, from Overberg MTB Events will be guiding riders to ensure they get the best results ever. Of course, while you’re in the area, our Haarwegskloof Reserve offers accommodation options to cyclists looking to take part in the training camps (or just looking to tackle routes on their own). Or pop in for the day, to experience nature at your own pace.